There was a man in service to Fujiwara no Shunzei (the compiler of an imperial poetry anthology, the Senzaishū) and who renounced the world after the death of his master. On a spring day, he decides to visit places in the western region of Japan and departs Kyoto with his fellow monks. On their way, they stop at Suma Bay and find a cherry tree. Then, an old man appears before them and prays to the cherry tree to console someone’s soul. Finding the old man, the traveling monk calls out to him and they have a conversation. The sun sets quickly. The monk asks the old man if he can accommodate the monk’s group for the night. Then, the old man quotes a poem composed by Taira no Tadanori and recommends that they stay under the cherry tree for the night. He further mentions that he wants them to perform a memorial ceremony for the tree because it is the grave marker of Tadanori. When the monk holds a memorial service, the old man is delighted and disappears behind the cherry tree. When the traveling monk sleeps under the cherry tree, the ghost of Tadanori appears in his dream. He laments that his poem was published anonymously in the Senzaishū anthology and requests that the monk talk to Fujiwara no Teika, who is the son of Shunzei and also a renowned poet, and have him clarify that the author of the poem is Tadanori. 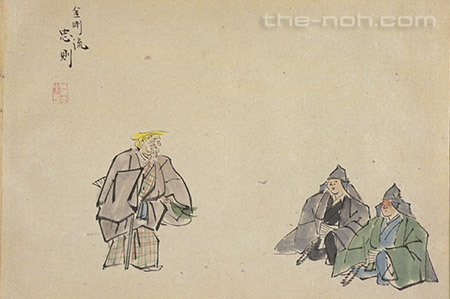 After showing the scene of his death in the Battle of Ichi-no-tani, the ghost returns to his place under the cherry tree while asking the monk to hold a memorial service for him. The lead character, Taira no Tadanori, was a mighty, well-respected warrior and an excellent poet; he was a very charming man with two completely different faces. His clan, the Heike, lost the war against the Genji, and this warrior lost his life in the Battle of Ichi-no-tani. He loved poetry much, and the main theme of this Noh drama is his deep commitment to poetry, which even allows him to transcend the boundary between this world and the next. Although his poem was selected for inclusion in the Senzaishū, an imperial anthology (a poetry anthology compiled under an order of an emperor), his name was left out because his family lost the war and were labeled imperial enemies. 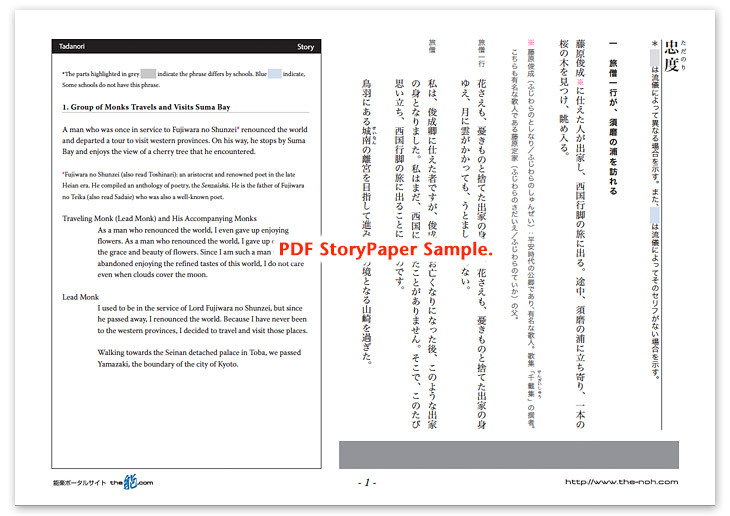 Tadanori, who became a ghost, appears in a dream of the traveling monk, who was a servant of Fujiwara no Shunzei (the editor of the anthology). He requests that the monk deliver his message expressing his desire to have his name included in the anthology. Tadanori, who pleads that his name be included, makes the audience understand how important it is for him to be remembered as a poet. The beauty of this play, Tadanori, lays in its depiction of Tadanori’s great passion for poetry, which is revealed in a story developed around a single poem about cherry blossoms. The story vividly describes this passion in a series of poetic and ethereal scenes. Since it includes the scene of his famous battle, the audience is trapped in the era and world in which Tadanori lived and enjoys sharing the dream with the traveling monk. This masterpiece exists beyond the dimensions of time and space, rich in the charms of Noh art.